It’s hard to believe that Apple sent their first email receipt in 2005, nearly a decade ago. Since then though, there hasn’t been a real innovation in moving receipts from paper to paperless. Paper receipts are hard to keep track of. They get balled up in pockets, thrown on the floor boards of the car, and end up on your dresser drawers. With all the technology there has to be a better way. Square offers a paperless receipt solution to all their users. When you pay with something using Square your credit card is automatically tied to either your cell phone number of your email address. The next time you use that same card with a different Square merchant your default is automatically selected and you get the receipt. The problem with that is that not everyone is using Square. The other problem, with both Square and Apple is that now your susceptible to spam. This problem has been driving Victor Yefremov crazy for years. That’s why he’s created OBLOCO a new paperless platform for receipts. OBLOCO isn’t email but rather a web and mobile based platform that merchants can use to quickly send a receipt, warranty information or other information that directly pertains to your purchases right to your account. All of that information is saved and you can access it from any web enabled device. Yefremov and the team at OBLOCO are hoping for wide adoption. If all goes well OBLOCO will be as widely seen in merchants everywhere as Verifone is today. Merchants will be tied into the OBLOCO platform and can instantly send the receipt information wirelessly and paperlessly to the customer. Customers will get a notification when their receipt has reached their OBLOCO account and can quickly make sure that they were charged the right amount and received the correct goods. OBLOCO will solve many problems and provide a new level of convenience to customers. OBLOCO users will be able to keep track of all of their receipts and at the same time keep track of all of their spending. Users will also have one place to go at tax time to quickly find the receipts they need at the end of the year. Within the OBLOCO platform users will be able to code receipts to suggested categories or create categories of their own. 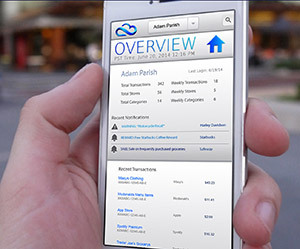 A family could track mom, dad’s and even the kids expenses separately. Are you using personal money for company expenses? No problem with OBLOCO with a click of a button those receipts can get instantly coded and stored so expense reports become a breeze. And finally, OBLOCO will have an impact on the environment. Currently millions of trees are used every year for paper receipts. If widely adopted the OBLOCO platform can save trees and create a greener planet.